Is romantic love unique only to humans? It is widely agreed upon that love in humans is largely a derivative of chemical interactions, including but not limited to testosterone, dopamine, epinephrine and serotonin. Still, love cannot possibly be defined only by a series of chemical reactions, can it? According to Joyce Leake, Animal Communicator and founder of Animal University, dogs’ attraction toward one another is determined by several factors. Besides a chemical allure, Leake believes that Fido’s need for “attraction” is also driven by his dependency on food, shelter, safety and need of acceptance. Furthermore, Leake believes Fido’s emotional maturity goes beyond the simple survival instinct and transcends to an actual feeling of compassion and caring. Jennifer Viegas, managing editor of The Dog Daily, concurs. status, not necessarily because of love. Looking at the behavioral side, wolves, a relative of dogs, often bond for life. Not unlike other monogamous relationships, they sometimes act jealous, possessive and even violent towards other members in the pack. 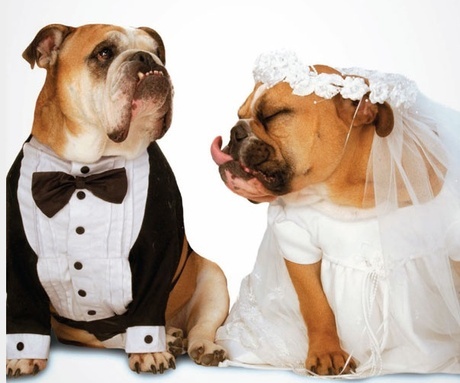 Pheromones play an active role in mate selection, but any Fido-owner will testify that dogs indicate happiness, anger, jealousy, curiosity, depression and excitement through body attitude, tail position and facial expressions. Is there a way to evaluate Fido’s emotion? Viegas says certainly by studying chemicals, brain waves, behavior and other components. Takotsubo cardiomyopathy, better known as the broken heart syndrome in humans, is when there is a temporary weakening of the heart brought on by extreme emotional stress, such as the death of a loved one. Many believe dogs live longer in pairs, and Viegas would venture that the same could possibly happen to a dog. However, with variables such as medical care, food quality, exercise, genetics, etc. any correlation is merely speculation at this point. But Leake says it is much simpler. “I can see it in his eyes, as the eyes are truly the windows of the soul, the expression, longing—conviction of any being ‘in love’ is always evident in the eyes.” Perhaps Leake is not far off. There exists a psychology experiment where one person gazes into a stranger’s eyes for a period of time. Results showed that the longer that person gazed, the more penchant the feelings were that the person developed for that stranger, measured by blood pressure and a number of other metrics. Another experiment measured the blood pressure and other signs of “love” by taking a person in love and showing them images of their loved one versus images of a stranger. Not surprisingly, the findings were similar.